Welcome to the Secretary of State’s High School and Youth Programs portal. This site contains important information about our office’s initiatives to educate and engage young Californians in the democratic process. We invite administrators, teachers, students and parents to use this page as a resource. This portal includes social media infographics, frequently asked questions and links to get young people informed and involved. Thank you for visiting our Back to School Pre-Registration Toolkit! Along with backpacks, school supplies, and new clothes, 16 and 17 year olds should add pre-registering to vote to their back to school checklist! And this website will help with that. Our toolkit below contains useful information and social media resources to help spread the word and encourage eligible 16 and 17 year olds to pre-register to vote. We provide access to our new "Our Time is Now" public service announcement (PSA), sample social media posts, and other important resources to educate California students. Online pre-registration is available for eligible 16 and 17 year olds by visiting registertovote.ca.gov. 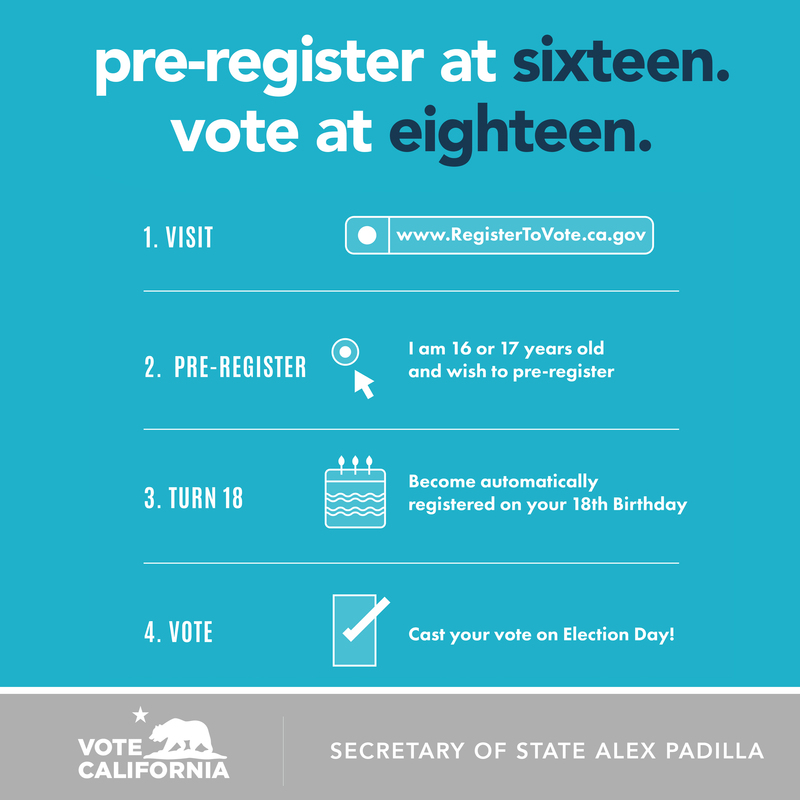 California youth who pre-register to vote will have their registration become active once they turn 18 years old. We invite you to view the information below and share it widely with family, friends, neighbors, and students. Last two weeks in April and September each year. 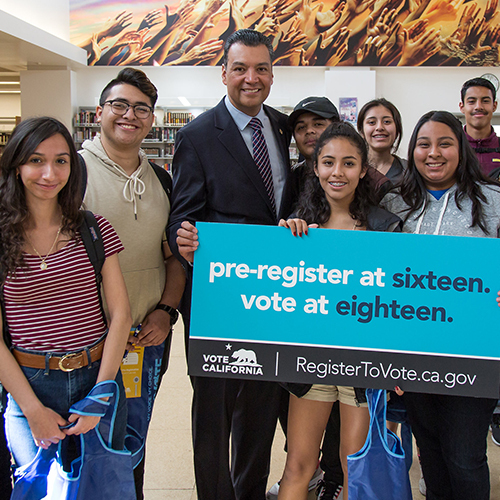 To encourage students to become active voters once they are old enough to cast a ballot, Secretary of State Alex Padilla and Superintendent of Public Instruction Tom Torlakson invite high school and middle school students, teachers and principals to participate in the California Student Mock Election, which will take place in Fall 2018, for the Gubernatorial General Election. Working with the California Campaign for the Civic Mission of Schools and the Constitutional Rights Foundation, in coordination with the MyVoice National Student Mock Election, the Student Mock Election will stir students' interest in voting by tapping into the excitement of the campaign season. As students learn about the candidates and issues, they discover how government and politics affect every part of their lives. They gain firsthand knowledge of how citizens make their voice heard in our democracy, and experience the power of their votes when they are joined by thousands of California students and millions more across the United States who will vote in student mock elections this year. If you have questions, please contact the California Student Mock Election Team at myvote@sos.ca.gov or (916) 651-3070. Thank you for visiting the California Secretary of State’s High School and Youth Initiatives website and for your interest in joining our efforts to increase opportunities for voter registration amongst students across our state. This guidance will assist you in helping your students learn more about California’s voter registration process. Your students will have varying levels of experience with the electoral process. Some students will come from personal or family backgrounds with an extensive history of civic and electoral engagement while others may not. You play a key role in educating students about the election process and voter registration. Students may mistakenly believe that because they are a resident of California that they are also United States citizens—please ensure that students fully understand the citizenship requirements and if students are uncertain as to their eligibility, to refrain from completing a voter registration card until they’ve determined their eligibility. Students may travel out of state, spend time out of the country, or have previously attended school out of state, but if their principal residence is in California, then they are a resident of California for voter registration purposes. If students move and change their principal residence after they have registered, they may update their address by visiting https://registertovote.ca.gov/. Additionally, for students planning to attend college, please visit our website for College Students and Voters Living Abroad at www.sos.ca.gov/elections/voting-resources/voting-california/students/. Even though students may be enrolled in driver’s education and/or applying for a driving permit at the age of 15½, they must be 16 or 17 years old in order to pre-register (and meet the other eligibility requirements). Extra credit or any other incentive must not be offered to students in exchange for them registering to vote or voting in an election. If students choose not to register to vote, are ineligible to register to vote, or do not know if they are eligible to vote, they can still get involved in the election process! Volunteer to Register Other Students to Vote. Your students can still get involved in the election process by registering others to vote and promoting voter registration efforts. There are no eligibility requirements in California for volunteering to register others to vote. However, please note that when registering others to vote, if the volunteer receives the completed voter registration form from the applicant or the applicant requests that the volunteer fill out the form on their behalf (put pen to paper), then the volunteer must complete the section titled, “Did someone help you fill out or deliver this form?” This section requests the volunteer’s signature, name, address, and phone number. *Students may also be eligible for a stipend ranging from $65 to $150 and are encouraged to contact their county elections official for more information. Thank you for your support in increasing voter registration opportunities for students across California.